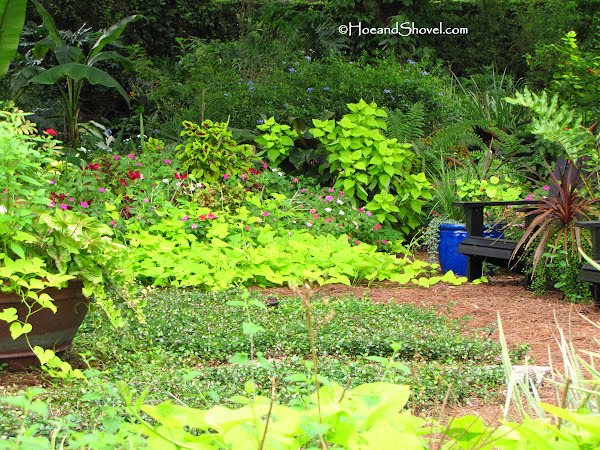 If August is wonderful for Florida gardeners, and it is, September is even better. Why? Because the garden is bursting at the seams from a long hot, rainy summer. Although my garden is well-suited for sauna-like conditions and actually thrives in it, the gardener is very appreciative of the promise September holds for autumnal changes. Subtle and incidental differences like night-time temps eventually dropping below 78F are the first indicators we are transitioning to a new season. I've learned to focus on the positive side of every stage in the garden but I have to tell you the prospect of upcoming cooler weather gives me feelings of giddiness. In the late summer garden blackberry lilies are still blooming sporadically. Although many have transformed from the lily ~~to the berry. Every phase of this plant is easy and carefree. It was just a couple of years ago these were gifted to me by fellow gardeners. 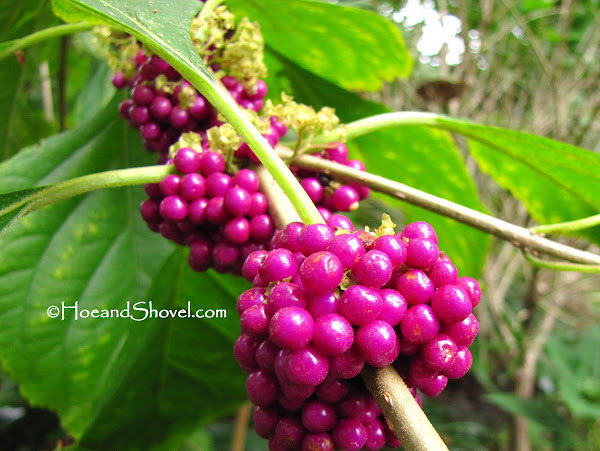 Each year they have multiplied from the seeds the berries drop. Shout-outs to my friend Kathi and Susan of Simply Susan ~~(((hugs))) for sharing. Our characteristically muggy climate lasts for more months than I prefer. 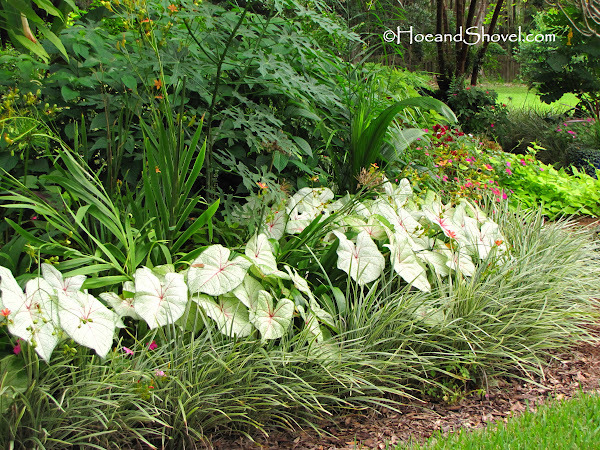 Showy flowering plants are not the normal sight in a shady Florida summer garden. 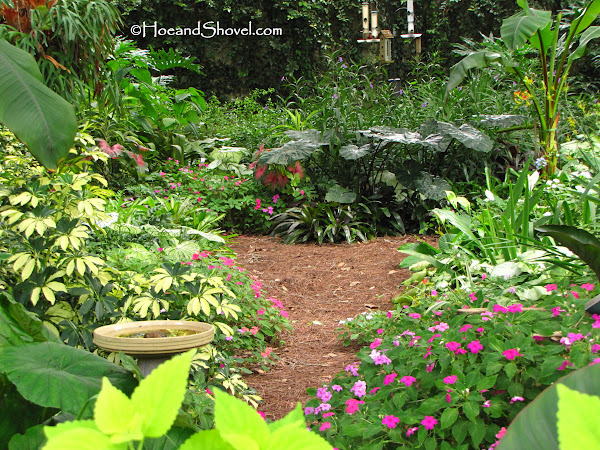 Wisdom beckons us to adjust our garden choices to texture and foliage for summer glory. Why fight the elements? We learn to flow with them. 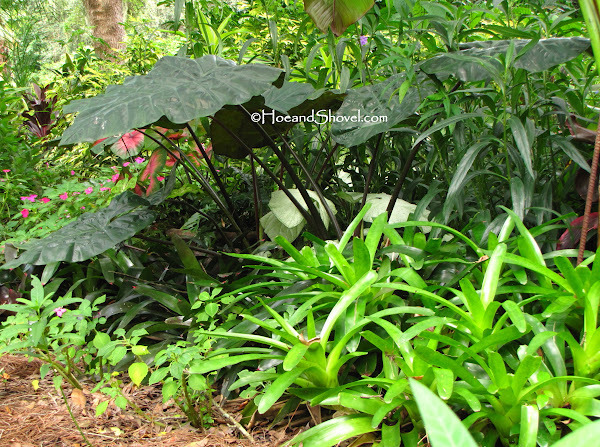 Companion plants of caladiums, coleus, ferns, bananas, irises, begonias, variegated plants, crinums, grasses, alocasias, philodendrons and many more ~~ give our gardens the sense that Florida is a tropical wonderland. 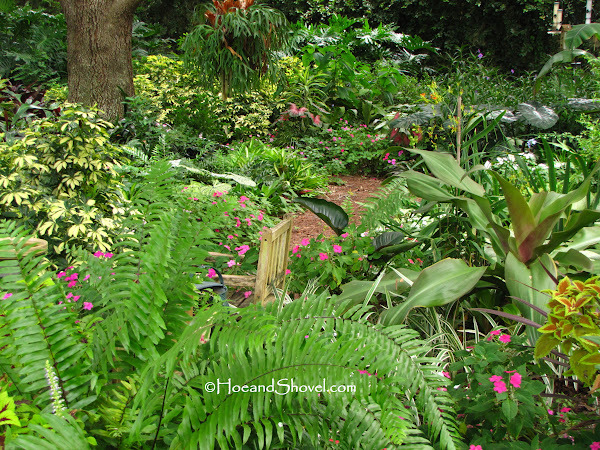 Down my tropical pathway where the shade gets thicker and thicker with each passing year it is the forms and textures that draw me there. And, of course, the deep cooling shade. After being out of town for several days recently I returned home to wander the pathways and breathe in the beginnings of this favorable month of September. 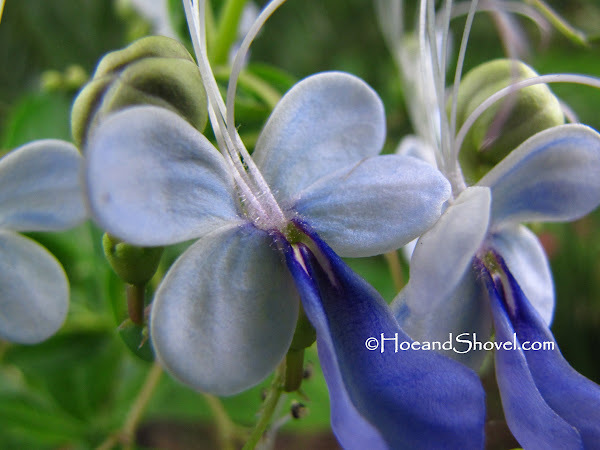 Blue butterfly (Ugandese Clerodendrum) is a consistent summer-through-fall bloomer. I have several bushes located in partial sun situations. The large cone-shaped bloom heads are comprised of individual butterfly replicas. So sweet... and blue! 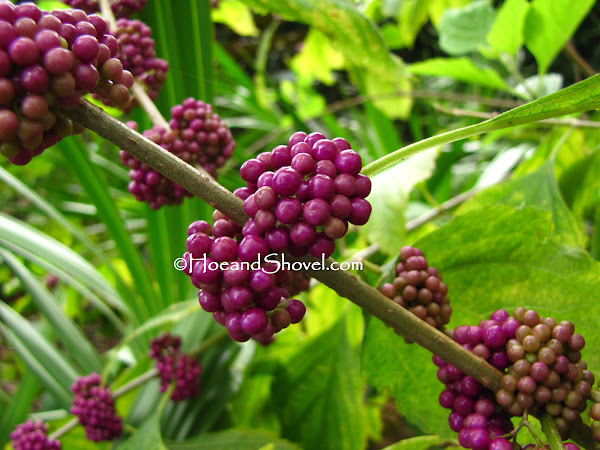 What begins in spring with tiny pink flowers on American beautyberry (Callicarpa americana)bushes turns into these plump, juicy-looking clusters of magenta by late summer. Birds of all sorts have already begun to nibble from their naturally-good bounty. 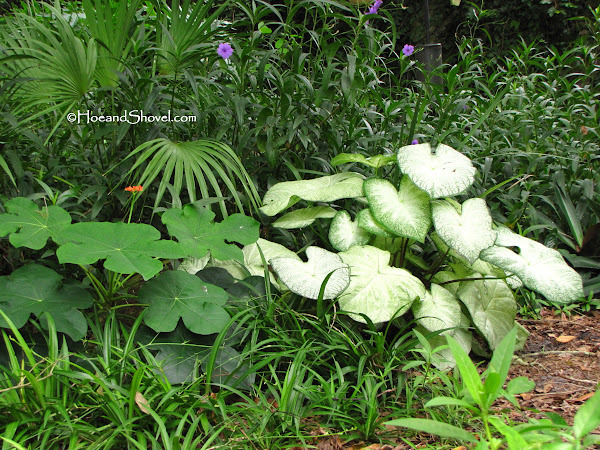 This summer the Stromanthe (not trio-star) in between the central perennial pathway and the tropical pathway turned into small trees (well, maybe not trees) forming fountains of foliage way above the mother plants at ground level. I adore the deep burgundy underside of the broad green leaves. No flowers... just simple texture and form beautifully contributing to the back gardens. 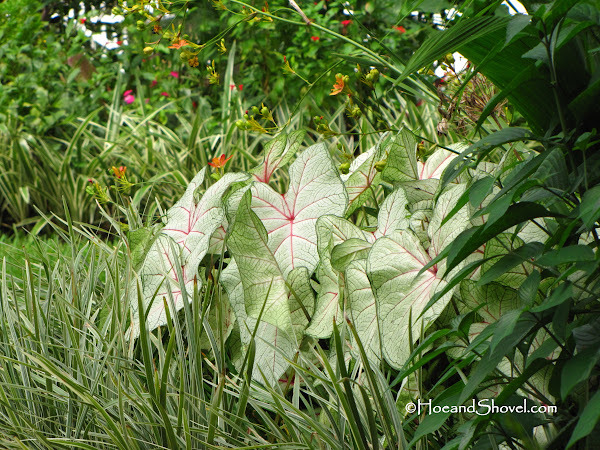 The tropical pathway might give the illusion of ending where bromeliads of all sizes,colors, and shapes hug the ground beneath 'plumbea nigra' alocasias and a red banana (Ensete ventricosum 'Maurelii'). But once your feet travel down this path there are actually more sights to see. Turning left ~ options to follow tributary trails through the central perennial garden or the way-back garden will keep you wandering. 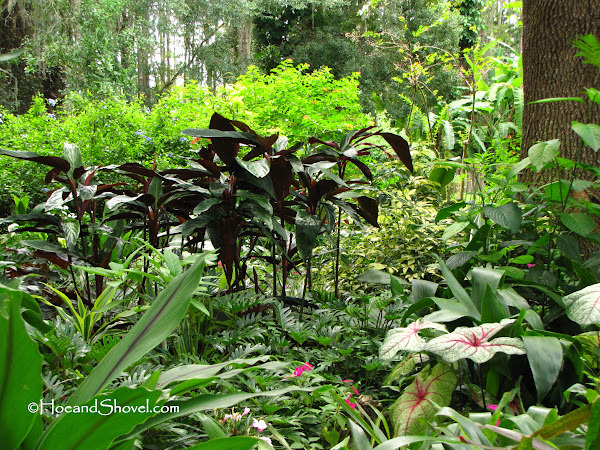 Turn to the right and you'll circle the backsides of the tropical garden as well as the butterfly and wildflower gardens. Or make a quicker turn and this trail (above) with 'moonlight' caladiums, buddha belly jatropha (podagrica), and giant oyster plants take you further back to the compost piles and bird feeders. The wildflower garden on the back side of the circle garden is just that... kind of wild. But a cluster of 'Red Flash' caladiums tucked at the foot of the arbor and below the candlestick cassia brings some order to the summer view. 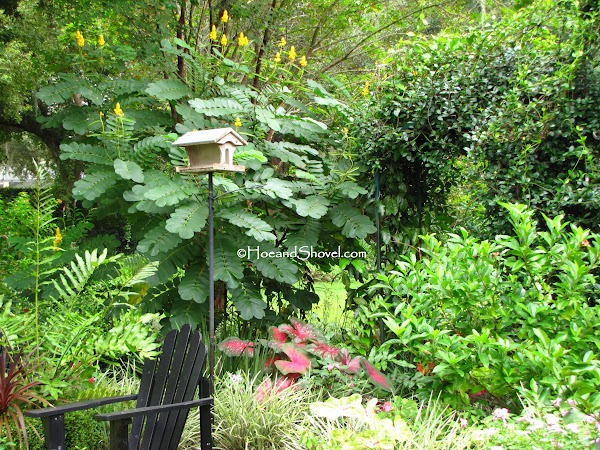 Another clump of 'Red Flash' caladiums in front of the cassia and the arbor draws the eye as well as strolling feet beyond the circle garden, under the arbor, and to the outer edges of the back garden. Sulphur butterflies continue to lay eggs on the candlestick cassias in the front and back gardens. These plants are every bit of 12' feet tall and full of golden 'candelstick' blooms that even the hummers visit. I fancy this variety of cassia for the large leaves that fold up at night fall. Summer's last days mean more rain with the slightest hint of cooler weather. Even though these factors signify an eventual decline in garden growth I look forward to the switcheroo this season brings. Are you looking forward to fall in the garden? I'm definitely looking forward to fall. Your garden is so lush and green. I hate this month for the muggy weather, but the plants always look so nice. Absolutely wonderful images, Meems! We, here in the PNW, still have summer. It started late for us this year, so we don't mind to have summery September. Beautiful images of your garden Meems. The Beauty Berry bush is so pretty and I love the Blackberry lilies. I hope it is a little cooler for you now. Your weather is so much like ours - just at opposite times of the year. We are just heading into Spring but know that soon it will be hot and humid. Your garden is certainly thriving. I love your choice of foliage combinations. Your "Black and blue" garden area has turned out beautifully, Meems. Everything in your landscape is so well thought out, and such an inspiration to newbies like myself. 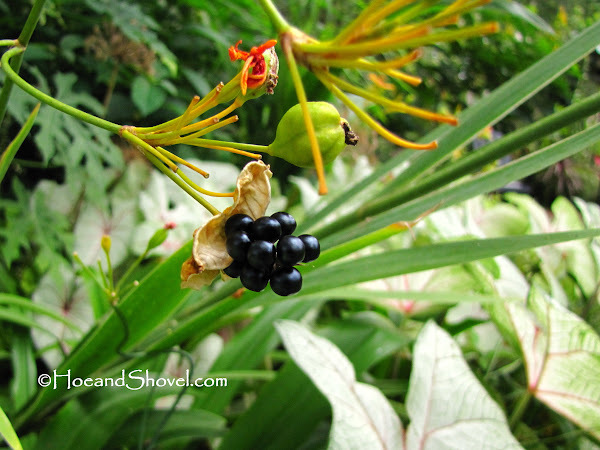 I received blackberry lily seeds from a friend just this year and they are now blooming -- can't wait to harvest seeds and pass them on! I have never seen blackberry lilies at my local nurseries, yet so many gardeners have them. There must be a whole lot of seed-sharing going on! No doubt about it. Fall is as exciting as getting a new pack of seeds! Spending more time outside in a bit cooler weather is what we gardners wait for every year. I too love this time of year. In Miami, fall comes a little later:). You are a great inspiration to all us Florida gardeners and beyond. What great design! 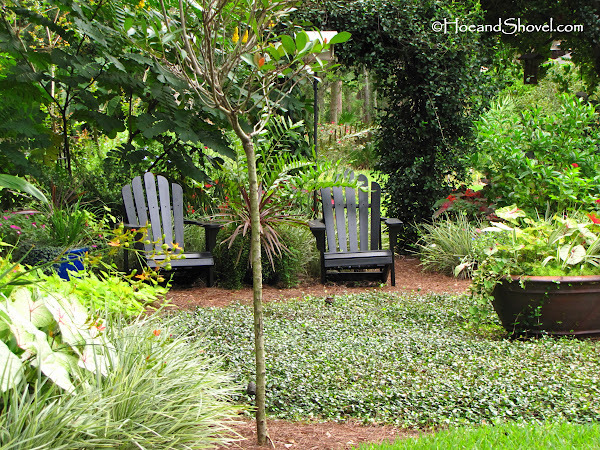 Everything in your garden looks as though it is settled in for the cooler weather. I can't wait for home-grown lettuce! Love your garden it always looks so nice and I trully am looking forward to fall also, it is my favorite time of year. Glorious! Oh, to go pinching in your garden. 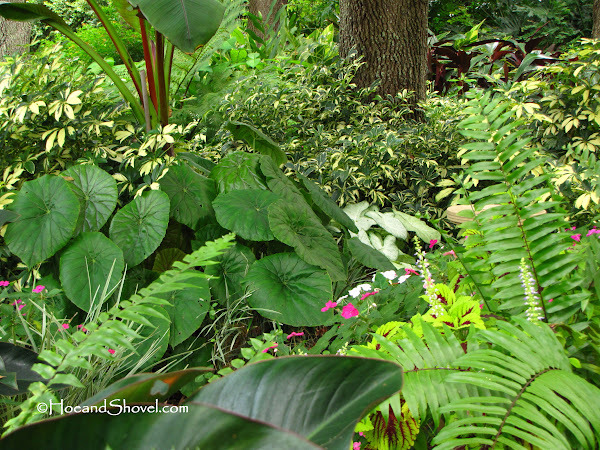 Such a wonderful example of beautiful Florida garden! That is a lush and healthy 'intentional biodiversity garden'. 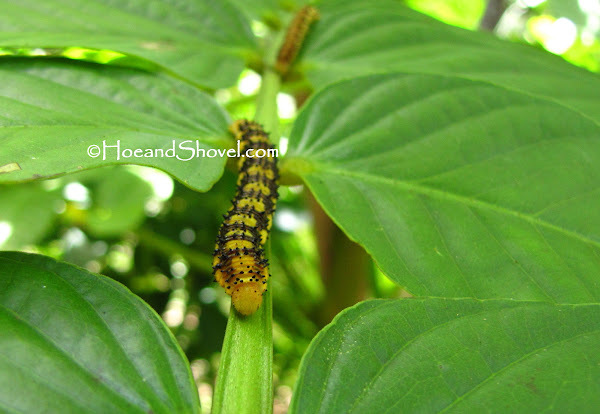 It doesn't seem like being visited by pests, except some larvae, whose eaten leaves don't show much. 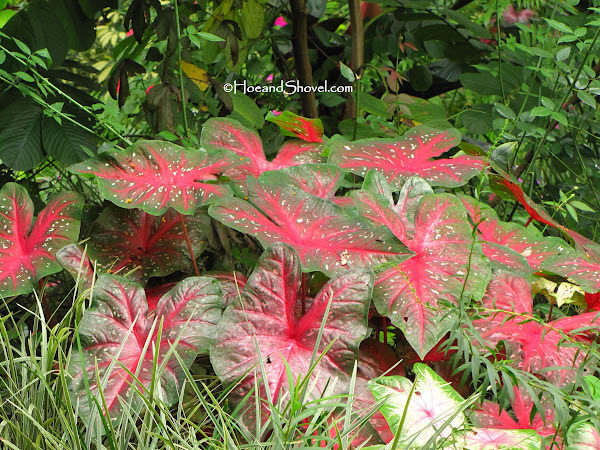 I still remember your older posts of lovely caladiums, and i appreciate these wider angle shots. 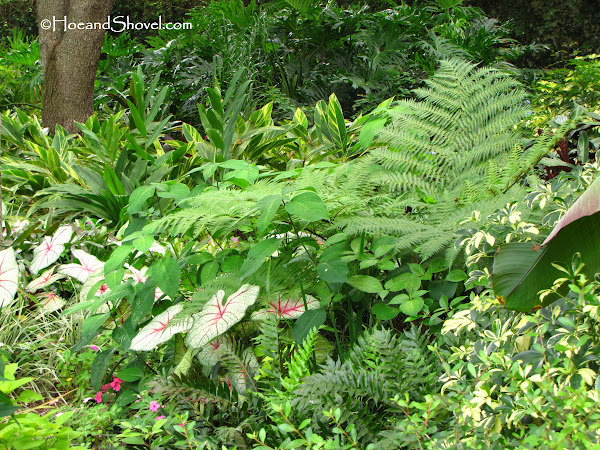 The plants certainly do respond nicely to the hot humid weather. Happy to share... thanks for visiting. I'm loving the beautyberry right now, too. Thanks. Not cooler yet but at least *closer* to cooler. It does seem like our weather is quite similar. Enjoy your spring. You are right, Nanette, I've never seen them in garden centers either. I really should try harvesting the seeds this year and starting some from seeds. Mine seems to scatter and spread on their own. Something about that cooler fall air puts us in the mood to stay outdoors! Thank you for visiting. I'm honored to add any encouragement to gardeners. Yummy lettuce... I can't wait either. It is a beautiful time ... a second spring! I remember when you were saying that about winter. :-)Our summer started way too early this year. We have some pests but the beneficial bugs do their thing and I don't worry about the rest. It is nice to see the broader view sometimes. Thank you for your kind comment. One word, Marmee! It's the beginning of great things, my dear! Your late summer garden is looking very lush and beautiful. I know I'm definitely looking forward to a little less heat and humidity...thankfully, we're not too far away now. 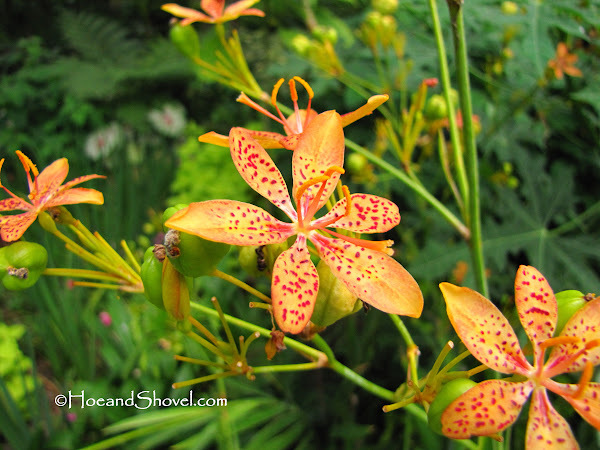 Thanks for the shout out on the blackberry lilies. I'm glad to hear they're multiplying nicely.